It’s probably more than fair to say that things are rough at Nissan at the moment. Besides the notoriously bland lineup, an aging sports car duo and the complaints we all have about CVTs, its former boss is facing trial in Japan and its executive ranks are being subsequently purged. What better way to take our minds off that than an electric vehicle concept—and one that’s a sedan, and not a crossover, for a change? 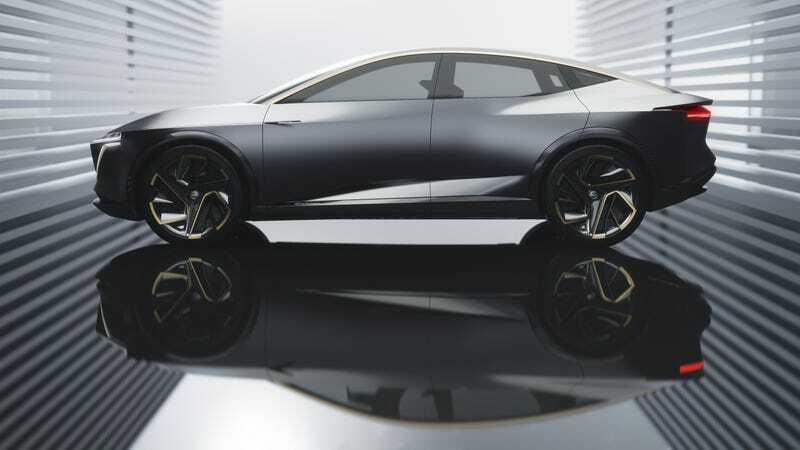 After teasing us with vague trailers and new tech at CES, the automaker has unveiled its newest all-electric long-range concept: the IMs. And boy, does this “elevated sports car sedan” look promising. It’s sleek, it’s on the tall side (not quite a crossover, but almost like a Volvo Cross Country) and it has a space-age interior. I definitely get the vibe they’re going after the Tesla Model 3 with this one, but I like it. Let’s talk specs. The IMs (which stands for Intelligent Mobility) is a sedan concept that’s intended to lead the way into Nissan’s EV future. With a fully dual-motor electric powertrain and a 115 kWh battery that generates 483 horsepower and 590 lb-ft of torque, Nissan predicts that the IMs will have an estimated driving range of 380 miles on a single charge. Nissan is aiming to combine electric technology with autonomous technology—drivers will be able to select either option, both of which are implemented in the IMs. In autonomous mode, the headlights will turn blue, alerting other drivers on the road to what’s going on behind the wheel. Neat! But we’ve learned to be skeptical about all of that, so grain of salt. The concept has an all-wheel drive system designed to produce great traction and cornering speeds. And, with an advanced air suspension system that adapts to unique driving situations, drivers can expect a smooth ride wherever they go. It’s also going to feature their new invisible-to-visible tech, which taps into a global user interface in order to most efficiently predict what you’ll see behind a blind corner or when to anticipate obstacles. Nissan announced their aim to introduce 12 EVs by 2022 with a projected 1 million sales being electrified at the same time. We’ll see if the IMs concept’s design translates into any of those cars, but if it does, I’d say they’re on the right track.